Oh my - this has to be one of the ultimate bookcases I've come across... 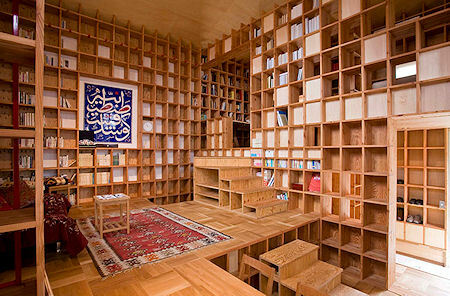 I was having a moment between things, did a search of bookcase images and found this - a whole house made of bookcases... That's got to be my idea of heaven! You have to hand it to the Japanese for fitting more of anything into a single space. This is in Osaka and the floor space is flexible apparently. Pretty cool, huh? So, my fellow book junkies, do we all want one? The stolen masterpieces would have to hang elsewhere in the house - but then, many of what would be on the shelves are, in fact masterpieces. And, coming from an artist who makes things to hang on walls, that's no mean statement!!! It is really amazing and this design of home show the love of home owner for books. I love it. Indeed it is amazing. Finding your comment brought me back to this post and the photo, which I'd not looked at for a while.